Italian multinational specialized in the hydraulic filtering sector, MP Filtri also boasts a steeply rising Power Transmission division, which has been recently completed with the new series of SGDR couplings with crowned teeth. A coupling that has just left the production line. MP Filtri is an innovative strongly growing company, which concentrates most of its activity in the filter sector. Moreover, an important division is dedicated to power transmissions and produces couplings and bell-housings. To know better this dynamic industrial reality and, especially, the new SGDR couplings, we visited the headquarters, at Pessano con Bornago (Milan, Italy). 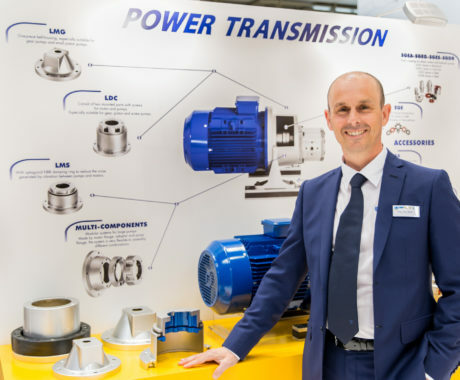 We met Ivan Facchetti, Product Manager for the Power Transmission division, and the engineer Massimiliano Sanna, Marketing Manager of the Group. Ivan Facchetti, Product Manager of the Power Transmission division. In 2017, MP Filtri Group reached 55 million Euros of turnover, with eight branches in various Countries in the world and over 300 distributors. It is a company strongly oriented to export, which constitutes about 75% of sales. «In our mix of products, Sanna explained us, about 80% is represented by filters and filtering elements, another 10% by instruments for measuring the fluid contamination and 10% by power transmission components. For the latter, we have set targets of strong growth: through the introduction of new product lines and the acquisition of new customers, we aim at reaching 6 millions of turnover within 2020. And he adds: “The company proposes itself as supplier of complete solutions for the manufacturers of hydraulic machines, plants and units. Our power transmissions are devices that facilitate the transmission between the electric motor and the pump, the device that provides energy to all hydraulic circuits inside machines». The line of Power Transmission products was devised about thirty years ago, after the takeover of a small company that produced various mechanical components, including the so-called “bell-housings”, coupling between electric motor and pump. Due to the takeover, MP Filtri started developing its own line of solutions. To achieve the full control of the production cycle, the company took over also a foundry, which today implements the majority of the semi-finished products of the division. 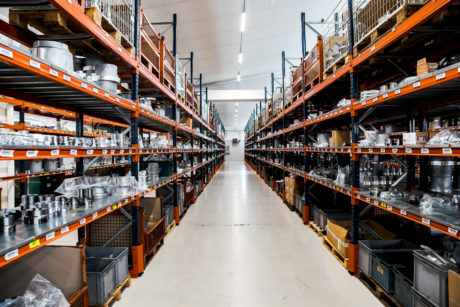 They were winning choices: today semi-finished components are finished and stocked by the company’s headquarters, at Pessano con Bornago, few kilometres from Milan. Ivan Facchetti told us how they have developed the product line he is responsible for: «After two years exclusively dedicated to design, in 2002 we made the first huge investment in this sector, in terms of both resources and machinery, with the target of widening the product range. Among the most important solutions manufactured in those years, stands out the line of bell-housings, today called “multicomponents”, ideal for the distribution net because, with few units stocked up, it grants several combinations. The successive goal was entering a new market, the one of end-users, through the creation of a series of monobloc bell-housings for a range of motors up to the 250 size, the widening of the line for gear pumps and the development of the “silenced bell-housing”, which allows decreasing the noise level in hydraulic plants ». Massimiliano Sanna, Marketing Manager of MP Filtri. Noteworthy the new coupling for the pack-mounting, without needing screw, with which the company has attained the total coverage of the length of the shafts where the same couplings are mounted. This solution provides a very important advantage, for both the manufacturer and the end-user: the assembly is more user-friendly and the product “does not come out”, as the coupling of backlashes and forces is granted. It is not necessary to perform registrations or controls on eventual misalignments during the machine service life. Besides, an outer ring has been added as cover of elastic inserts, not available previously, thus reducing the noise of the coupling itself. Moreover, Ivan Facchetti added: «We have also a series of cast iron couplings that is suitable for the mounting on IEC electric motors from size 71 up to size 355. On these couplings, we can execute drills according to metric and imperial standard, in compliance with all sector regulations, for a complete customization according to customers’ requirements». 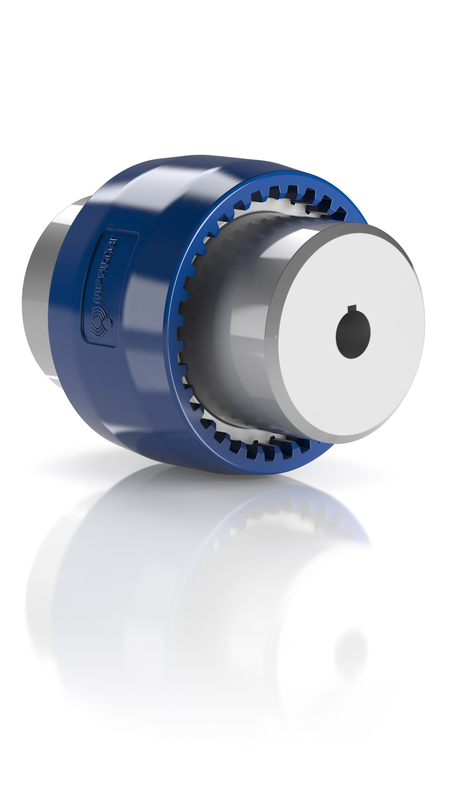 The most recent line of products dedicated to the power transmission are SGDR couplings. Ideal to transmit power from an electric motor to a hydraulic pump, these couplings can recover angular and radial misalignments between motors and pumps, in virtue of a high resistance to shocks and vibrations, they represent an element of vital importance in the applications on mobile plants. Specifically, the SGDR range, made of C40 carbon steel and with outer sleeve of Nylon PA66, is studied for electric motors with size ranging from 80 up to 200, according to the Standard IEC 72-1, able to withstand temperatures from – 20°C up to +90°C. Depending on the requirements, the coupling is available either with blank half-coupling to be customized according to the mounting or with half-coupling for splined and parallel shafts, and it is interchangeable with Parker Hydraulics products series UCDC (28, 42, 55). A coupling of the new SGDR series. Available with mounted screw, SGDR couplings operate with different fluid typologies, such as mineral oils, water emulsions or water-glycol type HFC. ATEX 2014/34/EU certified, they are suitable for use in potentially explosion-risk zones. 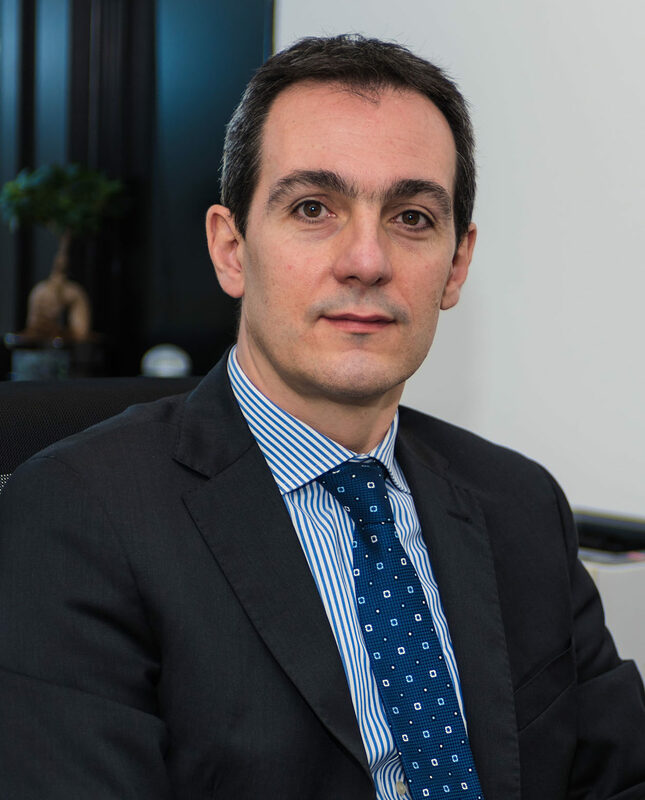 The enlargement of the coupling range is part of a well-defined strategic choice, as Massimiliano Sanna explained us: «The Power Transmission sector represents an excellent opportunity for MP Filtri: Assiot and Assofluid data, published in March 2018, highlight it is steeply rising, with an increment of sector performance by 11% in 2017 and an export growth by about 12 percentage points compared to 2016. Outstanding results that support our strategy of focusing on this segment in the course of next years, as reference partner for all distributors and OEM searching for solutions, like SGDR, able to match high performances in time». The production of these couplings started due to a demand by the British subsidiary for the “mobile” sector, that is to say of the machines that operate in motion. It is a product that has immediately obtained a good market outcome, finding applications in explosion engines, endothermic motors up to 10 kW, in applications like aerial platforms, where the connection between motor and a piston pump features small sizes. Another sector where SGDR have met a good diffusion are earth- handling machines. One of these advantages of this half-coupling is that, in case the nylon gear should wear beyond a certain threshold, is activated a system that separates the motion transmission, protecting the life of motor and of transmission organs. Thanks to a strongly verticalized production, which starts from the design in foundry and encompasses the simulation of the component operation and the implementation of the assembled product, MP Filtri can meet customers’ requirements even in small batches, starting from prototypes. This obviously implies a big effort of continuous intervention on manufacturing cycles but it is guarantee of a good competitive edge. The Power Transmission range by MP Filtri. It is a reason of pride, for MP Filtri, the choice of controlling the entire productive chain directly from Italy, without delocalizing, in order to meet quickly the requirements of all customers in short times, especially in case of customized products in small quantities. Compared to much bigger competitors, the company headquartered at Pessano con Bornago succeeds in intercepting a very important market segment. «This corporate choice – adds Sanna – is valid for all markets where MP Filtri is present, for both filters, couplings and bell-housings». Facchetti specifies: «Along the years, we have introduced all standard lengths in our catalogue, thus covering the almost totality of applications. However, there are always particular demands, stemming from specific requirements: the availability of a foundry allows us to mount and dismount dies without waiting for production idle times, as it would unavoidably happen with external suppliers». 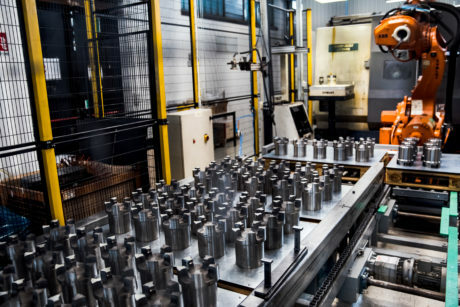 The foundry, which is located at Lurano (BG), close to the mechanical workshop, is equipped for the aluminium working whereas iron castings are purchased from external suppliers. What are the most important sectors for MP Filtri, in Power Transmission ambit? «A sector that is giving excellent results – highlights Ivan Facchetti – is the one of renewable energies, especially in China: we have just acquired a big order for the handling of solar panels and some job orders for the handling of control units of turbine blades. We have recently entered this segment but with a big potential. After China, which is a driving market for us, Spain and United States follow ». 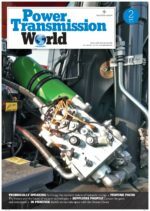 The Oil&Gas represents a significant item, too: «For one of our most relevant customers in France, to which we supply thousands of couplings yearly, we have set up a customization work on dispensing pumps with deliveries up to 3000 litres per minute. Starting from one of our standard solutions, we have implemented some couplings tailored for its requirements, about thirty codes, with variation of geometries, hub diameters and fastenings». One of the robots of the factory in Via Matteotti. The new warehouse at Pessano con Bornago. Concerning the other two divisions – filters and contamination control devices – MP Filtri can boast a perfectly equipped laboratory taking up 2,500 m2, implemented in recent years, an in-house forefront structure in Europe. This allows testing internally the products in conformity with all regulations. The innovative component that characterizes MP Filtri production is part of the company’s genetic heritage. Since its establishment, in fact, MP Filtri has paid great attention to the research and development of forefront technological solutions, investing huge resources in this activity every year. In the new laboratory, a real “breeding ground”, a team of technologists satisfies the requirements submitted by the market, implementing new high-quality products, able to pass the severe standards imposed by international regulations. 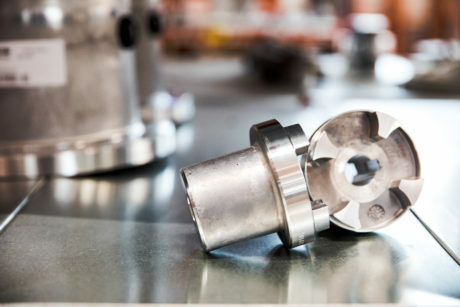 All design phases are executed with the aid of sophisticated computerized CAD systems, which allow shortening development times of products and at the same time improving quality.